He belongs to us All. Bimal Declares from his Atma this Divine Language. On the 27th of September 2009 was Sri Swami Sai Ayyappa Jayanti. On this day Bimal Pandey wore his Purple robes. As he entered, the room was filled with his Divine energy and everyone was in awe. The chanting started as he entered the house of the devotees. As he entered Various chantings started first to Sri Aum, Sri Ganapathi, Sri Vishnu, Sri Shiva, Sri Rajarajeshwari and the Sri Ayyapa. This chanting carried on for about 20 minutes and then we chanted his Divine 108 Names. As we did this he went around the room blessing the devotees by putting his hand on their heads. He also went around throwing flowers on everyone. This was beautiful and the excitement was inside of everyone. After Chanting followed an hour of Bhajans. As usual we started by singing praise to Sri Ganapathi Devaa. After many Ayyappa Bhajans followed and then other Bhajans to various Gods and Goddesses. During the Bhajans Bimal carried on throwing flowers on people and blessing the devotees. After Bhajans Bimal then sang Bhajans to the devotees. 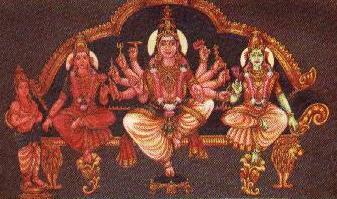 Radika Javeena, aum Shivaya Aum Shivaya, Mana-Mohana Nandalal, Sharade Sharade. Prasadam was then served. Bimal fed each devotee by his hands with a special Indian sweet in which he had brought and blessed himself for everyone there. After everybody had eaten there were questions and answers. This is where devotees are free to ask any questions they have e.g. problems, unanswered dreams or any other unanswered problems. After which Bimal Pandey gave a speech. He talked about how now is the time people are going to suffer from their actions. Everything is about action and reaction. If you do bad, then due to karma you can only receive bad. If you do good then naturally you will receive good.Bimal also described the power of thought. If you think good thoughts then good things will manifest around you. If you are constantly moaning and being miserable then that energy will manifest. This is reaction. Every action that you do has a reaction. This is the law of the universe. Everything people have done wrong in this world will fall on their heads. Bimal Was checking his Divine Leela Pictures on his phone while the children were collecting the blessed chocolates from him. As you can see a blue/white circle has appeared just infront of bimals head. The history started of when, on of the demons, Mahishasuran, Son of Ramban, undertook a severe penance . Lord Brahma was aware of this but still tried to distract his concentration, but having failed in his attempts, he appeared before the Asura and blessed him with a boon. Mahishasuran asked Lord Brahma to give him a boon by which no man in the earth would be able to kill him, and Lord Brahma conferred the boon on him. 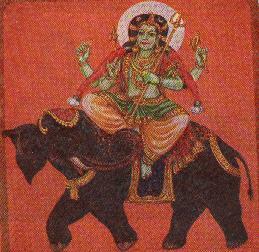 Mahishasuran, armed with his boon, began to commit atrocities and murders on the earth and terrorise people. Fearing his wrath, people ran away to far away places. The Devas seeing the atrocities committed by Mahishasuran came to the conclusion that only a divine power could kill him and approached Chandikadevi (Mahishasuramardhini) pleading to put an end to Mahishasura who was misusing the boon given by Lord Brahma. 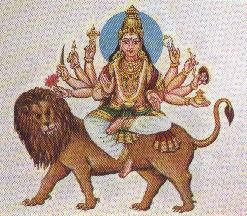 Chandikadevi also known as Goddess Durga set out on her mission and killed Mahishasura in a duel, on earth. 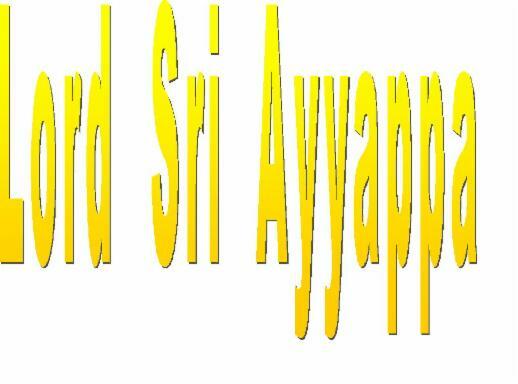 Lord Sri Ayyapan was born out of a crisis that overtook the gods. The asura princess Mahishi was burning up with anger at the dirty trick the gods had pulled on her brother the asura king Mahisasura. Mahishi therefore began performing a fearsome set of austerities, and so surpassed all records in that tapasya or askesis, that Brahma The Creator had really no option but to give her what she wanted. Her boon was to rule the universe and to be invulnerable except to a being that had the combined strength of both Shiva and Vishnu. Since such a person did not exist, she thought she was safe and began the usual asura career of conquest and plunder. The gods prayed to Lord Shiva and Vishnu to save them from this catastrophe. The two great gods really did not know what to do until from the ever-active mind of the great Vishnu came a possible solution. When Vishnu had taken on the Kurma Avatar, he also had to manifest himself as Mohini, the enchantress, to save the nectar of immortality from the demons who were not willing to share it with the gods. If he became Mohini again, then the female Mohini and the male Shiva could have the divine child who would combine their powers and beat Mahishi. Shiva the Divine Ascetic became enchanted by Mohini's beauty. From their Union came a Vira, a brave knight, galloping on a white horse, waving a lance. 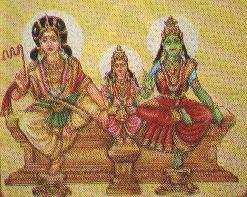 He is also known as Bhuthanatha, Dharmasastha, Hariharan, Ayyanar and Manikanta. King Rajasekara was very talented, courageous and just in his deeds. People were living happily and prosperously during his time as king. However, the king was very unhappy that he had no children and his subjects were also worried that he had no heir to inherit his kingdom. As per the wish of the queen, both of them prayed to Lord Shiva for child. Lord Shiva, answered Rajasekara's prayer and ordered Lord Ayyapa to take the avathar on earth . On the day King Rajasekara went for hunting in the forest, Ayyappan took the form of a baby with a golden chain and bell around his neck and placed himself near the Pamba river. King Rajasekara went for hunting in the forest adjoining the banks of River Pampa, along with his men. He started hunting courageously in the dense forest which was a sanctuary for many wild animals. After that hunting was over, King Rajasekara advised his men to take rest and sat there entertaining himself with the sight of the natural greenish beauty and the waterfalls, of the forest. At that time, he heard a child crying from somewhere in the forest. Surprised, he went round and reached the banks of River Pampa. There he saw a beautiful and divine child (i.e. Ayyappa) kicking its legs and crying out, and was in a dilemma whether to take the child to the Palace or leave it there itself. While the King was engrossed in his thoughts, a Sanyasi appeared before him and told the King that he need not be afraid of the child and take him to the Palace and that the child belonged to Kshatriya dynasty capable of relieving all sufferings. The Sanyasi further stated that since the Child had a golden bell around his neck, his name be called "MANIKANDAN". He was also told that when the child reached the age of twelve , the King would know his divine history. After uttering these words, the Sanyasi disappeared. The King of Pandalam was very happy and he took the child to his Palace and briefed the Queen about the incident. The King and the Queen, having prayed to Lord Shiva, for a child, were very happy that they had been blessed with a child. The people also felt happy that a heir to inherit the Kingdom after the King, has been found. However, the Diwan of the Kingdom who was thinking that he would be the next crown after Rajasekara was worried. When the child, named Manikandan, began to grow in the Palace, everything began to prosper in kingdom. He was taught all martial arts and sastras and the Guru was surprised at his brilliance and agility and the extraordinary talents. The Guru came to the conclusion that he was not an ordinary child, but a divine power. After completing his education under the Guru, Manikandan approached the Guru to offer his Guru Dakshina. was dumb should be given speech. Manikandan called the Guru's son and put his hands on his head and immediately Guru's son had his speech. Manikandan requested the Guru not to reveal this to anyone and went to the Palace. In the meanwhile, the Queen gave birth to a male child and the child was named RajaRajan. King Rajasekara, impressed with the talents of Manikandan, decided to crown him, treating him as his eldest son. He ordered the Diwan to make arrangements for the same. The Diwan hated this and started devising plans to prevent Manikandan from being crowned to the throne and to annihilate him. He tried various methods including poisoning of food, but failed in all these. However, Manikandan's body bore an injury due to these and ordinary physicians could not cure it. So than lastly, Lord Shiva disguised himself as a physician, came and treated Manikandan's injury and cured him. Having failed in all his attempts to kill Manikandan, the Diwan approached the Queen and told her that as she had her own son, it was not correct to crown a person who came from the forest. He further told the Queen since Arthasastra itself has justified any misdeed if it was done to extract a good thing, he would suggest that the Queen should pretend as if suffering from severe headache and stomach pain and he would make the physician tell that only a tigress' milk should be brought to cure the Queen and since Manikandan would only go to the forest to bring the milk, he would be in danger from the wild animals and even if Manikandan returned without bringing the tigress' milk, the King's love for him would not be as before. The Queen, became a prey to the Diwan's plot and agreed to do what he told, so that her son could succeed the King to the throne. The Queen, as told by the Diwan, cried out loudly that she was suffering from severe headache and stomach pain and the King, believing this, so called the Diwan to bring in the best physicians to treat her. The Physician, brought by the Diwan examined the Queen and told the King that the Queen had been suffering from a dangerous disease and it could be cured only by applying Tigress' milk .The King sent several of his men to the forest for bringing this milk. The King understood that it was an impossible task and wanted his dear Queen to be cured at any cost and offered half of his Kingdom to anybody who brought the Milk. he would be cursed for not curing the Queen. Since the King persisted in his refusal Manikandan wanted the King to promise to do something he wanted. The King gave the promise and asked him what he wanted and immediately Manikandan asked the King to permit to go to the Forest. The King felt disappointed that he had been tricked and with no other alternative permitted Manikandan to go to the forest. King Rajasekara made arrangements to send a group of his loyal men along with Manikandan, which however was refused by Manikandan on the ground that the tigress might run away seeing the crowd of soldiers. King Rajasekara sent along with Manikandan necessary foodstuffs and coconuts with three-eyes, in remembrance of Lord Shiva. The Panchabuthas, sent by Lord Shiva, accompanied Manikandan to Forest. However, on his way Manikandan, came to know the atrocities of Mahishi in the Devaloka, he went there and fought a battle with Mahishi. 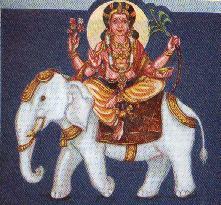 During the conflict, Manikandan threw Mahishi down to earth from devaloka and she fell on the banks of Azhutha River. Manikandan clashed with her at Azhutha river again. go to the Palace with Lord Devendran in the form of a tiger. With Manikandan on the tiger, all female devas in the disguise of a tigress and male Devas, as tigers started their journey to the Palace. When Manikandan, with the tigers, approached the Palace, the people who ridiculed him when the started his journey to forest whether he wanted a toy tigresses, really got panicky seeing the violent bunch of animals and started running helter shelter. Just then, the same Sanyasi who appeared before King Rajasekara when he picked up Manikandan at the forest as a baby, appeared again at the palace and told King Rajasekara the real identity of Manikandan. Hearing this, the King stood in great surprise and silence. He saw Manikandan riding a tiger and people running away. Seeing the King, Manikandan descended from the Tige and told him that since the tigresses were there, he could get the Queen cured with their milk. King Rajasekara, fell at his feet and asked to forgive him for whatever happened without his knowledge, and asked him to send back the tigers as the Queens ailment had been cured the moment Manikandan went to the forest. On that day Manikandan reached the age of twelve. King Rajasekara told Manikandan that the Diwan was responsible for all these things and hence he should be punished. However, Manikandan told the king that he need not punish the Diwan and all had happened only through the will of God, and he told further that time had come for him to go to Devaloka since the task for which he took avatar himself on the Earth is completed and asked the King what boon he wanted from him and he was ready to give it as he was much pleased by his devotion. Immediately, King Rajasekara told him that they wanted to raise a temple in his memory and suggest a suitable place for the temple. Manikandan aimed an arrow which fell at a place called Sabari, where in Sri Rama's era a Sanyasini called Sabari observed Dhavam. Lord Manikandan told the King to build the temple in that place and then he disappeared. As per Saint Agasthya's advise, King Rajasekara laid the foundation stone for the building the Sabarimala Shrine. 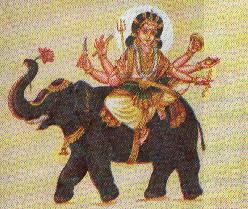 Bhagwan Manikandan, had made it clear that he would grace only those devotees who offer Dharshan after performing Vritha for fortyone days keeping themselves isolated from family desires and tastes and leading a life like Brahmacharya, thinking of good things always, and that while coming for his darshan, they shall carry the holy irumudi on their heads, as the Bhagwan did when he went to the forest to fetch tigress milk, and bathed in River Pampa raising slogans of Saranam and climb the eighteen stairs. As graced by the Bhagwan, King Rajasekara completed building of the temple with eighteen steps to reach it. When the King was thinking how to put Dharmasastha's figure in the temple for darshan to devotees, he recalled the words of the Bhagwan, the River Pampa was a holy river as River Ganga, Sabarimala was a holy place as Kasi. 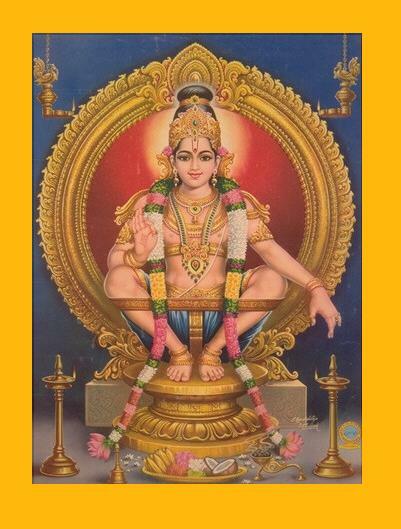 Dharmasastha sent Parasuraman to Sabarimala who carved the figure of Lord Ayyappa and installed it on the day of Makarasankranthi, the day on which the Makara Jothi appears. Every year lakhs and lakhs of people throng to Sabarimala irrespective of caste or creed and adorn themselves with garlands and irumudis, chants slogans on Lord Ayyappa, bathe in holy river Pampa, climb up the eighteen steps and get the grace of Lord Ayyappa, the Dharmasastha. The Makara Vilakku Pooja is a seven-day festival conducted annually in the Lord Sri Ayyappa Temple at Sabarimala. The Makara Vilakku Pooja commemorates the day on which the idol of Lord Ayyappa or Dharma Sastha was enshrined in the temple and is the most important event to be conducted at Sabarimala. One very important ceremony of Makara Villaku is the bringing of Lord Ayyappa’s jewellery, Thirivabharanam from the Pandalam Palace, three days prior to Makara Sankranthi. The sacred jewelry is kept in a box and is brought in a royal procession. On the arrival of the jewel boxes the whole mountain reverberates to the chanting of 'Saranam Ayyappa' by millions of devotees gathered all over the world to watch this wondrous event. A priest, or an oracle, on his head carries the box of jewellery. The oracle moves hysterically oblivious of the presence of thousands of people. He dances, but the box remains on his head. Procession halts at a few temples on route and reaches Sabaripettam in the evening of Makara Sankranthi. It then moves towards Sannidhanam amongst music, dazzling lights and lot of revelry. A strange phenomenon occurs at this time. A kite appears all of a sudden and starts hovering around the box. The incidence is well received by the devotees who get filled with joy. Another huge experience, which takes place at Sabarimala during the Makara Villaku, is the Makara Jyothi which is usually on January 14th but can vary every year. This year (2008), Makara Jyothi is on the 14th January. 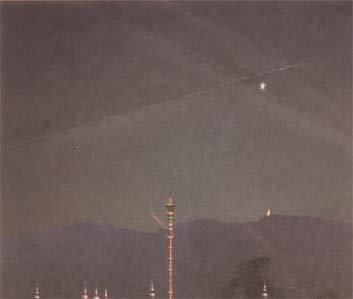 Makara Jyothi is a beacon that appears at dusk on the day of Makara Sankaranthi (14 January) on the Kantamala hills facing (north-eastern side) the Sabarimala temple, a popular Hindu pilgrim center in Kerala India. 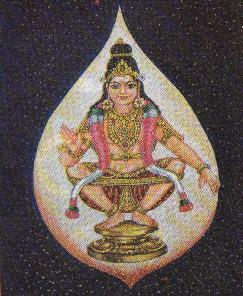 It is widely believed by many devotees that this Jyothi represents the celestial manifestation of the Lord Ayyappan himself. 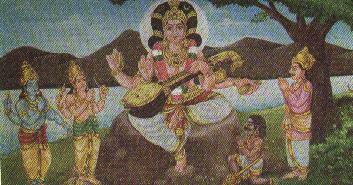 Some others believe that the Jyothi is the Arati performed by the rishis and devas residing in the Kantamala hills. The Divine Star Uttrarnis is also sighted on this auspicious day. 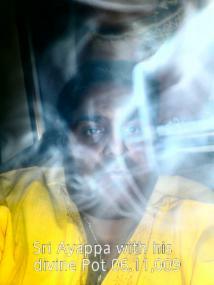 Sri Mantra Saasta can be seen just above Bimals left eye. On the forehead. Kaala Saasta and St.John. St.John's eye can be seen very clearly. 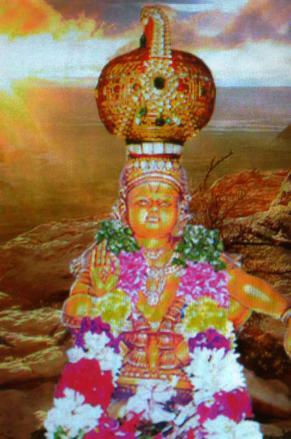 The face of lord Sri Ayyappan can be seen from a side view. 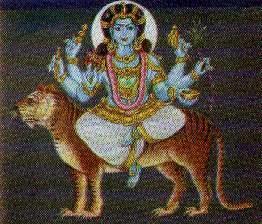 I bow to Lord Shasta (Ayyappa, the upholder of Dharma and Sastra) who gladdens the heart of Parvathi. He is a peerless warrior who protects all. His glory is great and He deserves great reverence and devoted worship. Then 21 Loka’s then 3 minutes silence.